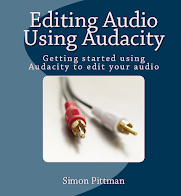 An updated edition of this guide is available to purchase as a book - "Editing Audio Using Audacity" - click here for more details and to order the book from Amazon. This is a short guide to using Audacity, originally created in 2008 while volunteerinng at a local hospital radio, aimed at those who may be unfamilier with the software. Updated and expanded, the document now includes extra information, including setting up Audacity. This document can be used for personal use and by registered charities free of charge for their own training. If you plan on using this within a commercial setting, any situation where payment or profit would be made by use of the document, or you would like the document tailored for your company, e-mail simon@libraryplayer.co.uk to discuss pricing. This guide is no longer available to download.